Eamann O Ruairc tells us: “The man standing in front of it is my grandfather, Michael (Mick) Magee. He began working as a driver, but since he was a very skilled mechanic (he had served his time as a motor mechanic and had spent World War I as a driver in the Army Service Corps on the Western Front) he was soon put to work as a mechanic in the depot in Dormanstown. During his stay in Redcar; Mike became deeply involved in trade unionism and in socialist politics. At some point he became the chauffeur of a Fabian MP. Whether this was a full-time job or a part-time one I do not know. Mike may have worked for the Transport Workers Union and was also very active in the organisation of the 1926 general strike. In 1930 he emigrated to Detroit where he became a key figure in the trade unions in the Ford factories”. Craig White tells us: “Looks like Redcar Lane Cemetery chapel in background , so this would be Thwaites Lane running up to the Racecourse stands”. 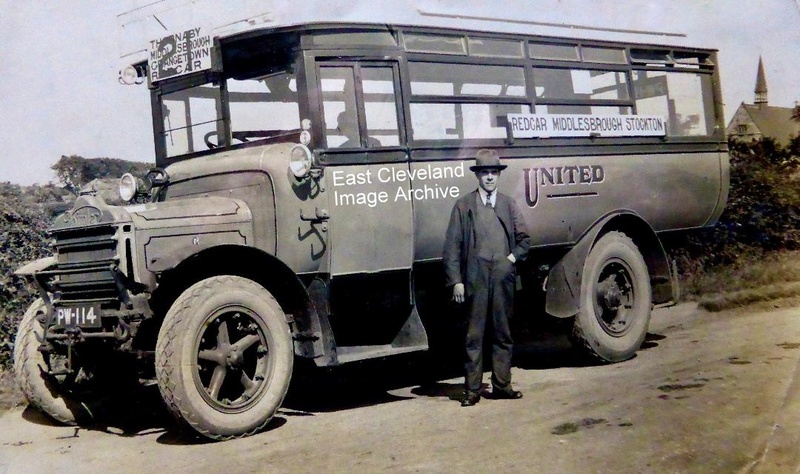 Image and information courtesy of Eamann O Ruairc; Eamann is also seeking further information about United Bus Company in Redcar in the early 1920s. Thanks to Craig White for the update regarding location of this image. Looks like Redcar Lane Cemetery chapel in background , so this would be Thwaites Lane running up to the Racecourse stands.